At EUKANUBA, we're proud to provide quality nutrition that builds through every life stage. Meet Dylan, a lively flat coated retriever who has been fed EUKANUBA since he was a puppy. 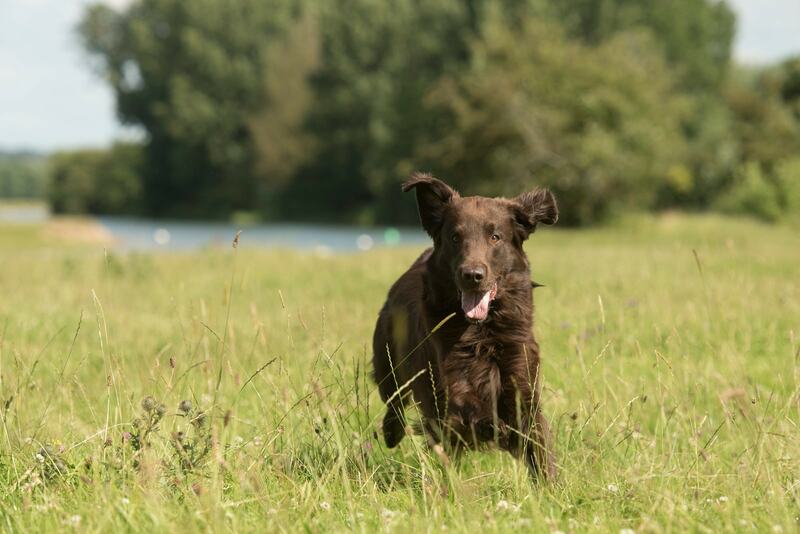 Dylan is a seven year old Flat Coated Retriever who lives in West Sussex with his owners Mike and Sarah and the couple’s other Flat Coated Retriever, 13 year old Apollo. Dylan joined his new family when he was just a puppy. Mike and Sarah knew they wanted to stick with the breed they loved, and had a specific wish for a dog with the less common liver colouring, rather than the usual black. After searching through all the breeders of Flat Coated Retrievers in the area, they finally found one liver-coloured male – the youngest in a litter of 13 puppies. Like most dogs, Dylan loves to run. He will happily chase his favourite tennis ball for hours – even into the sea! Dylan was fed EUKANUBA puppy when he was small. It gave him all the energy he needed to grow and develop. As well as copying everything that older dog Apollo did, Dylan quickly learned how to behave with the help of DHA - it's in all EUKANUBA puppy foods and helps puppies to learn and be more trainable. Flat coated retrievers have long, luxurious coats and so it’s vital that it stays in great condition. EUKANUBA contains the optimal ratio of omega 6 & 3 fatty acids, which contribute to a radiant and healthy-looking coat, and it’s certainly noticeable in Dylan. As well as a healthy and shiny coat on the outside, Dylan’s owners can be sure that he is getting all the right nutrients on the inside. At around 18 months old, Dylan moved onto EUKANUBA adult food. It gives him the right levels of protein and fat to help him build lean muscle, as well as calcium and glucosamine to keep his bones and joints healthy. This is especially important for larger breeds as they can experience difficulties with their joints in later life. Now that Dylan is seven years old, Mike and Sarah feed him EUKANUBA for mature dogs. The tasty recipe is rich in fresh chicken, helping Dylan to maintain lean muscle to help keep him in the best possible shape for a long and healthy life.